It is true—astronauts are not weightless. Weight, as scientists use the term, refers to the gravitational attraction of a planet (or moon) for another object. For example, when you step on a bathroom scale, it reads your weight, let’s say 100 pounds. This means that the Earth is attracting you with a 100 pound force. It is this force that will cause you to fall to ground if you jump off the top bunk of your bunk bed. When you stand on the ground (or the scale), that 100 pound force is still present. You don’t fall because the ground exerts a 100 pound force upward on you. The two forces act on you in opposite directions, so they cancel each other out and you don’t fall (or speed upwards either). What would happen if you jumped out of an airplane? The Earth’s gravity would pull you towards the ground but because there’s no force acting upwards on you to cancel gravity, you’d fall, speeding up as you headed towards the ground. What would happen if you were in a box that was also speeding up towards the ground? The box would be falling toward the ground at the same rate. If you touched the floor (or ceiling or wall), the box would exert a force on you and push you away from it. Thus, you would feel weightless. This is exactly what happens in a spacecraft orbiting the Earth. The Earth’s gravitational force does indeed weaken as an object moves away from the Earth. At the distance of the International Space Station, for example (200-270 miles above Earth’s surface), gravity is about 90% of what it is at ground level (if you weighed 100 pounds at ground level, the Earth would attract you with a 90 pound force in the International Space Station). This force would make you fall towards the ground. The entire Space Station is falling towards the ground at the same rate. Thus, if you tried to stand on the “floor” of the Space Station, the force between the “floor” and your foot would push you away from the wall and you would have the sensation of weightlessness. So why does the Space Station not eventually crash into the Earth? Its speed is adjusted so that it falls at exactly the same rate as the ground drops away due to the Earth’s curvature. Let me put that another way. Scientists and engineers give the Space Station a forward speed. If Earth’s gravity weren’t operating, the Station would travel in a straight line. The Earth, of course, is curved. If it weren’t for gravity, the distance between the Earth and the Station would continually increase (1). 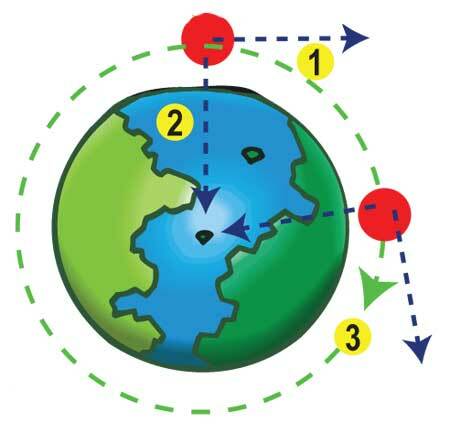 However, Earth’s gravity pulls the Station towards the ground (2), changing its path from a straight-line path to a curved path (3). The speed is adjusted to that the Station’s curved path matches the curvature of the Earth. Since both the Station and its astronauts are falling at the same rate, the astronauts have the sensation of weightlessness like you being in a box falling out of an airplane. You may be interested to know that astronauts train for weightlessness in an aircraft known as the “Vomit Comet”. After climbing to a high altitude, the plane goes into a dive where it keeps the same horizontal speed, but speeds up towards the ground at the rate gravity would speed you up. Those inside the plane experience the sensation of weightlessness just as though they were in a box and kicked out of the airplane (but much more safely!!). People think that being weightless means that there is no gravity. That is not true. There is plenty of gravity in space! The reason an astronaut appears to be weightless is because he and everything else in the Space Station are orbiting the Earth and hence falling toward the Earth at the same rate. This is called free-fall. With a pencil, poke two holes in the cup on opposite sides near the bottom. Fill the cup with water. Gravity pulls the water out of the holes. If you drop the cup, what do you think will happen to the water coming out of the holes while the cup falls? Fill the cup with water and drop it. What did you observe? When you’re holding the cup, the water falls out of theholes because of gravity. But when the cup and water fall together, the water stops coming out of the holes. The water is falling with the cup and becomes weightless, just as an astronaut experiences weightlessness when falling with the spaceship. ← If molecules in colder things get denser, why does ice float?